OAK Long Bar is throwing a party for ladies to celebrate ladies the day before Valentine’s Day, popularly known as Galentine’s Day. 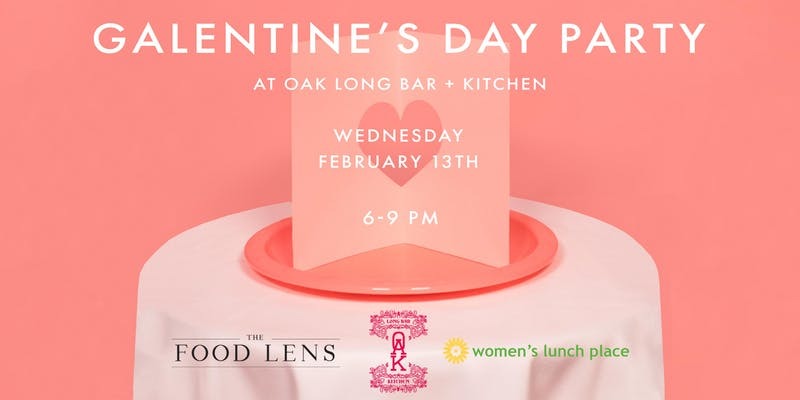 On Wednesday, February 13, from 6:00–9:00 PM, join The Food Lens and OAK Long Bar + Kitchen for a Galentine’s Day soirée, a night of sipping, snacking, and sweets—all while supporting a local charity that serves homeless women. Tickets are $55 and include all food, two specialty cocktails, the wine tasting, and a charitable monetary donation. *OAK Long Bar will donate $10 from your ticket* to Women’s Lunch Place, a daytime shelter on Newbury Street offering a safe sanctuary, nutritious meals and critical support services for Boston women experiencing poverty and homelessness. “What’s Galentine’s Day? Oh, it’s only the best day of the year!” – Leslie Knope. The holiday was created by the show “Parks and Recreation” and has since transcended the TV screen to become a beloved tradition of celebrating female friendships annually on February 13, whether that be your friend, sister, co-worker, mom, partner, or whoever! The Food Lens is a curated website that enables the culinarily curious to discover or rediscover Boston’s dining scene. Eternally curious and always hungry, female founders Molly Ford and Sarah Jesup have eaten their way through the city, culling the most authentic dining experiences Boston has to offer.